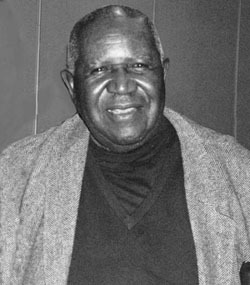 Thomas Fleming was a founding editor and columnist of one of the leading African American newspapers in California, the San Francisco-based Sun-Reporter. Born in Jacksonville, Florida in 1907, Fleming migrated to Chico, California in 1918 to live with his mother upon her divorce from Thomas’s father. After working as a cook for the Southern Pacific Railroad in the 1920s, Fleming attended Chico State College in the 1930s where he studied journalism. Persistent racial discrimination limited his employment options. Aside from contributing several articles to a local San Francisco newspaper on the 1934 General Strike, he was unable to find steady work as a journalist. World War II brought dramatic changes to the San Francisco Bay Area, including a sizable influx of African Americans who came to work in the region’s war industries. At the height of the war, in the summer of 1944, Fleming was hired as the first editor of the Reporter, a newspaper serving the burgeoning San Francisco African American community. Fleming used his new position to crusade against racism while covering local and state politics. In 1949 Fleming’s friend, Dr. Carlton B. Goodlett, won control of another newspaper, the Sun, and merged it with Fleming’s paper to form the Sun-Reporter. Over the next fifty years, with Goodlett as publisher and Fleming as editor and political reporter, the two built the Sun-Reporter into the largest newspaper serving the African American community in Northern California. As the Civil Rights Movement grew, Fleming used the pages of the Sun-Reporter to support Bay Area activism and educate African Americans about political issues that affected their lives. Fleming’s political reports took him to national party conventions, international conferences, and to meetings with at least two presidents, where he continued to press for the political empowerment of African Americans. Fleming continued writing into the twenty-first century, submitting a weekly column to the Sun-Reporter as well as authoring a multipart series titled “Reflections on Black History” that was syndicated to over two hundred black newspapers. A lifelong bachelor, Fleming succumbed to congestive heart failure in November 2006.